The main feature of this site is the BLACKCATHOLIC blog that will run actively on the home page. As stated on the About BLACKCATHOLIC page, the blog will discuss various topics surrounding Catholicism, Christianity in general, liturgy, religion, philosophy, Black Catholicism, and other issues I connect to these topics. Most posts will be about various and uncategorized topics, but there will also be what I call “article-series” which will be posts that are part of a running thematic series tackling some aspect of the Catholic faith. The list of article-series categories will be here and on the ever-present bar of links on the left side of your screen as they are introduced (right above “Social Media Stuff”). I will feature a Black Catholic saint from history (or soon to be one) and tell a little about him/her and what I believe we can all learn from this godly one about holiness. For the title, I drew some inspiration from the title of journalist John Howard Griffin’s 1961 book “Black Like Me” though I am not drawing from its content. I’ve always like the ring of its title, but along with that – I’m Black and I’m Catholic, and here are some great Catholic examples who were Black as well. Additionally, while canonized people and those on the way to being canonized will be the main focus, I may also include recent examples of Black Catholics (deceased and living) who are also good examples of “Catholicism through a colored lens.” The holy ones featured in this series will be added to the Black Saints and Holy Ones list described below. Adapted from an original image of the tv show “Martin.” All rights to the original go to the FOX Broadcasting Company. Used under Fair Use (Parody, Small Portion, Non-Profit). Quotes from Church Fathers and saints (“Cat”-holics) from way back in history with some of my brief commentary. Historical periods: Early Church to Middle Ages. 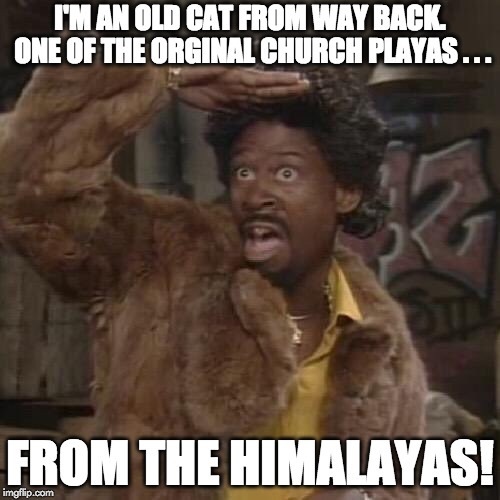 The title is in reference/parody of the 90s Black sitcom Martin featuring one of Martin Lawrence’s many characters from the show, Jerome, an “old mack from way back. One of the original playas . . . from the Himalayas!” I created the above meme myself! I write for other Catholic platforms too. When I have articles published elsewhere I will have some of them previewed here and will provide a link to the full article on the original site of the post. Commentary on the prayers that we encounter every Sunday Mass but perhaps are easily overlooked and become just part of the liturgical scenery. The goal of this series is to give you an opportunity to contemplate these beautiful prayers the Church gives us before, during, and after Mass. This series begins with some of the fixed prayers in the liturgy then will move to the prayers that change every week such as the Collect and Offertory. Memes I make from time to time. Feel free to share! Patron Saints of BLACKCATHOLIC – Who backs this page on the other side of eternity. Black Saints and Holy Ones – Collection of Black/African saints especially those covered in Black (And Catholic) Like Me article-series. List is on-going. List of good general Catholic resources for your edification. List of Black Catholic resources for more info on Black Catholicism and displays of Black Catholics living out their faith in the Church. List of other good Catholic blogs I come across so I can spread the love around the Catholic blogosphere and send some traffic their way.